Elliott also said he plans to appeal the fine. The money from the fine goes to the NFL Player Care Foundation and the Gene Upshaw Players Association’s Players Assistance Trust. 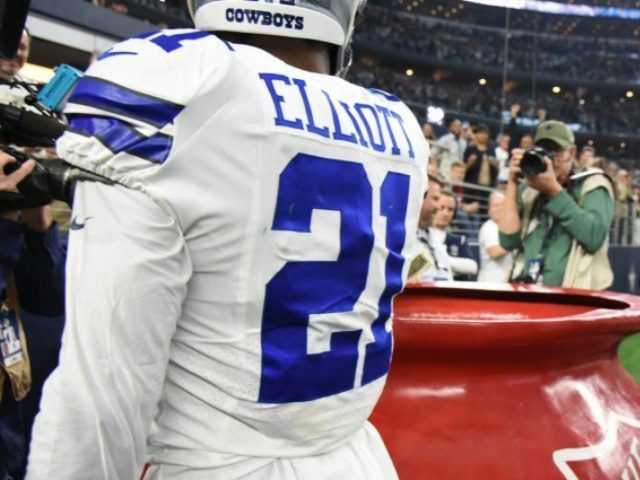 The Thanksgiving Day gift was not Elliott’s first interaction with the big red kettle behind the end zone. Elliott also jumped into it during his rookie season, but he was not fined for that celebration. He donated $21,000 to the charity and watched Salvation Army donations spike. “A lot of things they [the NFL] do define ridiculous. but that’s not really any of my business, not anything I can change,” Elliott said. Elliott and quarterback Dak Prescott each pledged $21,000 donations to the Salvation Army following the win against the Redskins. The Cowboys matched the donations. Elliott said he thinks the NFL should donate his fine to the Salvation Army. The Cowboys superstar has 1,150 yards and six scores on a league-high 240 carries this season. He also has a league-high 293 touches for 1,573 yards from scrimmage. The Cowboys have an NFC East clash against the Philadelphia Eagles at 4:25 p.m. on Sunday at AT&T Stadium in Arlington, Texas.